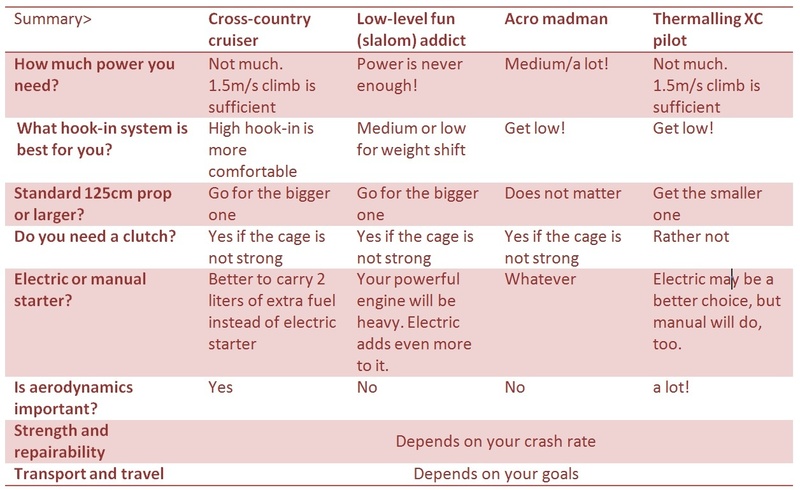 What is (will be) your flying style? Cross-country cruiser> Is it the birds-eye perspective on long crosscountry flights what you seek from paramotoring? Launch, gain altitude, let the brake toggles go and fly fast and far. Flying will never get boring but it is natural to human to seek progress. It may happen that after some airtime you look for some more adrenaline. You may look for disciplines where you could learn/show more skills. If yes, you will have much higher requirements on your paramotor and your priorities will change.